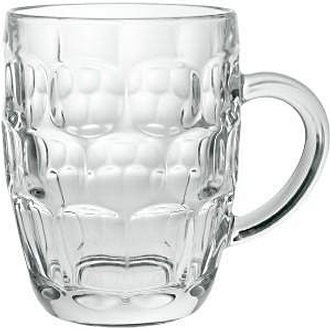 The traditional or "Dimple" Pint Glass is based upon the World War II hand Grenade shape. Today they are actually rarer then the new nonic (no handled) pint glass and is gaining more and more popularity. The main feature being the handle and the round dimple finish of the glass. There seems to be a 'north' / 'south' divide in terms or 'straight' versus 'dimple' pint glass. Southerners tend to opt for the dimple where as 'northerners' opt for the straight pint glass, This is not always the case but is an interesting observation. The Dimple Pint glass follows the UK's law in terms of the amount it can contain - 568ml or in USA terms; 1.2 US pints. In British terms - it contains a full 1 pint!